Stockholm is a multicultural city with a population of about one million people, representing nationalities from all over the world. It is a fast growing city with green space and rivers and streams running coursing around more than 17 islands all connected by bridges. Stockholm is considered one of the greenest cities in the world and it has been nicknamed the Venice of the North. The winters are dark and cold with the spring melting the snow as the days become longer and longer reaching its peak at the summer solstice in June which has Sweden’s longest day of the year with the sunrise at 3 AM and sunset 11 PM. It gives you the feeling that the sun never sets. Stockholm is a trendy city with a high quality of life as well as security. The city is well known for innovation hubs, fashion and design, and culinary delights. 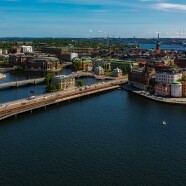 Stockholm is not only the capital of the country, but also the capital of well-known international companies such as Skype, Spotify, Klarna and Mojang. In Stockholm, there are a variety of restaurants serving everything from classical Swedish food to Asian, African, and Middle Eastern food. With the famous Swedish “fika” (coffee break) come plenty of coffee houses scattered throughout the city. Commuting in Stockholm is relatively simple with an easily navigated subway system, trams, commuter trains and busses taking you wherever you need to go within the city and its suburbs. There are many bicycle paths throughout the city and many commuters bicycle to work. Weather never stops the Swedes, with many bicycling to work in the winter. Yes, there are winter tires for bicycles! You can find out more about Sweden at the Everything Sweden website or at Radio Sweden’s English news site. EU citizens can work and study or start a business in Sweden without a residence permit. This is called right of residence. If you have a right of residence you don´t have to visit the Swedish Migration Agency. If you are planning to live in Sweden for an extended period of time, you must register with the Swedish Population Register and apply for a Swedish Identity Card. To apply, visit a Tax Agency (there are several located throughout Stockholm). If you are planning to run your own business, don’t forget to register your business. You will find more information at the Swedish Tax Agency website. Swedes are more or less bilingual, speaking English rather fluently. It is definitely possible to live in Sweden for many years without learning Swedish. However, if you are planning to stay for an extended period of time and be 100 percent involved in Swedish society, it is wise to learn the language. In addition, speaking Swedish will open many doors in the labor market. Although Swedes speak English, Swedish is the country’s official language, and many companies and organizations will require knowledge of the language. If you are hoping for a long-term career in Sweden, begin learning Swedish as soon as possible. Check out the Swedish Institute’s free online course on Swedish for beginners and Folkuniversitetet’s language courses. Only 10 percent of the jobs available in Sweden are advertised on company webpages and on job portals, leaving 90 percent of the positions to the so-called hidden job market. Today, Swedish companies are overwhelmed with applicants who do not meet company requirements. As a result, without a CV that perfectly matches the job requirements, don’t expect to be called for an interview. Sending your CV to published announcements is rarely a successful job search tactic in Sweden. Rather, you should network and learn more about companies you’d like to work for and then headhunt your own job. Plan to spend thee to eight months searching for a job (depending on the industry). Tip: Get involved with associations that speak your language, such as Stockholm’s Chamber of Commerce, Företagarna -the Swedish Federation of Business Owners, and Business Sweden that provides access to contacts and networks at all levels. Also check out expat organizations such as InterNations and Expat Arrivals, as well as getting involved in non-professional activities. A temporary job can often lead to a more permanent position. Passport Career has an extensive list of networking resources including the Chambers of Commerce, professional organizations, and expat groups in Stockholm and the surrounding area. Temporary jobs provided by staffing agencies are common in Sweden and it is worth checking their websites before arriving. The largest staffing agencies are Manpower, Poolia and Adecco. More specialized staffing agencies within engineering and IT are Technogarden, Sogeti and Experis. It is difficult to sign a work contract before arriving in Sweden. Instead, take this time to prepared your CV and become familiar with companies that are headquartered in Sweden. Examples of job portals that Swedish companies are using are: Indeed, Glassdoor, CareerBuilder and LinkedIn. Permanent jobs are difficult to find so you may want to consider freelancing. eWork provides freelancer contracts. If you don´t want to start your own company Frilansfinans and Coolcompany are alternatives that take care of invoicing, paperwork, taxes, and other services. You can open an account for free. Stockholm has been ranked as the one of the best (if not the best) cities to work and have a family. Most people don’t work more than 50 hours per week and try to have work-free weekends. Swedes are not known for small talk and respect privacy. This can come across as being cold and reserved. However, this is easily overcome by doing things the Swedes do. The Swedes love staying active and outdoor workouts. Check out gyms such as NordicWellness, Sats, or why not Crossfit box! If you don´t like working out, take a class in cooking, yoga, handcraft, history, or art. You can choose among many courses depending on your interest at Folkuniversitetet’s or Sensus websites. Explore the beautiful Swedish outdoors. Remember the famous saying, “There is no bad weather, only being poorly clothed.” This sums up the Swedes’ attitude. Get out and explore the great outdoors, regardless the weather! Sweden prides itself on its forests (being a major exporter of paper) and their preservation. Many enjoy a day wandering the woods picking mushrooms or a variety of berries (but be sure to learn the poisonous ones from the edible ones). Frilufsfrämjandet (translation: Outdoor Association) offers many tours from skiing, skating, kayaking to many other family-friendly activities. If you have small children and are a stay-home parent, we recommend Open Day Care. Open Day Care is free of charge and is a great way to connect with other parents. WANT TO KNOW MORE ABOUT MOVING YOUR CAREER TO A FOREIGN COUNTRY? Passport Career provides more detailed career information and extensive resources as well as career training about networking, finding a job, internship, alternative career opportunities, job search using social media as well as information on writing CVs, cover letters and interviews. If your organization, embassy, university/college, library, or other institution would like access to our country portfolios (15,000+ pages of expert content for 80+ countries and 250+ cities) to share with your students, employees, spouses/partners, and others managing a national or international career transition, please click here to contact us (or send email to: global@passportcareer.com) regarding a free, live, online demo and details on how to obtain a license to access Passport Career.